General note: Names given in Chinese, then in Manchu (full posthumous name is in Chinese only). 1. Was emperor of Manchuria between October 8, 1643-October 30, 1644. Officially proclaimed emperor of China on October 30, 1644. The Shunzhi Emperor (顺治帝, Shunzhi (reign name, or nien-hao), personal name Fu-lin, temple name (miao-hao) Shih-tsu, posthumous name (shih) Chang-ti) (March 15, 1638–February 5, 1661?) was the third emperor of the Manchu Qing dynasty, and the first Qing emperor to rule over China proper from 1644 to 1661. The ninth son of Huang Taiji (Abahai) (1592–1643), the great ruler of the Manchu kingdom of Manchuria, he succeeded to the throne in 1643 at the age of six and ruled under the regency of Dorgon (1612–1650), a paternal uncle. In 1644, after Manchu troops captured Peking, he was proclaimed emperor of the Qing dynasty (1644 – 1911/1912), with the reign title of Shun-chih. During his short reign, Shunzhi established a number of precedents which characterized the Qing dynasty until its end in 1911. He encouraged the participation of Han Chinese in government while pursuing policies to win the support of the Chinese intellectuals, such as reinstating the civil service examinations and the Confucian curriculum. In order to forestall the possibility of challenges to the authority of the Imperial court he ordered the Upper Three of the Eight Banners (Manchu military divisions) to be put under the direct control of the emperor. In 1652, he welcomed the fifth Dalai Lama and granted him an honorific title, a golden certificate of appointment, and a golden seal of authority. Shunzhi is also noted for having taken Johann Adam Schall von Bell (湯若望), a Jesuit from Germany, as his personal mentor and advisor on subjects ranging from astronomy and technology to government. The Shunzhi Emperor (顺治帝, Shunzhi) was born March 15, 1638, and ascended to the throne at the age of five (six according to traditional Chinese age reckoning) in 1643, upon the death of his father, Huang Taiji (皇太極, Huáng Tàijí), the first Emperor of the Qing Dynasty. Huang Taiji had consolidated the empire founded by his father, Nurhaci, and laid the groundwork for the conquering of the Ming dynasty in China, although he died before this was accomplished. He was responsible for changing the name of his people from Jurchen to Manchu in 1635, and the name of the dynasty from Late Jin to Qing in 1636. He died a young man, when the Qing pacification of Ming China was almost complete, and the circumstances of his death have been the subject of rumor and speculation. During the early part of the Shunzhi Emperor’s reign, actual power lay in the hands of the appointed regents, Princes Dorgon and Jirgalang. In the midst of much upheaval, the Manchus seized control of Beijing in June 1644, and in October of the same year the Shunzhi emperor's uncle, the chief regent Prince, proclaimed the Qing dynasty to be the legitimate successor to the Ming Dynasty. 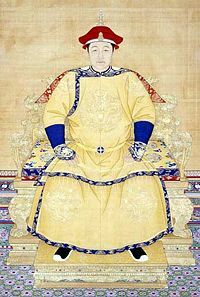 Therefore, although the Shunzhi emperor was not the founder of the Qing dynasty, he was the first Qing emperor of China. His mother was the Empress Dowager Xiaozhuang who was an excellent politician. The young emperor disliked his uncle, the chief regent Prince Dorgon, and after Dorgon's death in 1650 the emperor stripped both him and Dorgon's brother, Dodo, of their titles, although he was only twelve years old at the time. During his short reign, the Shunzhi emperor encouraged the Han Chinese to participate in government activities, and employed Han Chinese to teach his children. He was a scholar and pursued policies to win the support of the Chinese intellectuals, reinstating the civil service examinations and the Confucian curriculum. He enlisted Han intellectuals in scholarly projects, notably the compilation of a history of the Ming dynasty, under imperial patronage. He was open-minded and relied on the advice of Johann Adam Schall von Bell( 湯若望), a Jesuit from Germany, for guidance on subjects ranging from astronomy and technology to suggestions for governing an empire. Shunzhi elevated Schall to the status of his personal mentor and gave him free access to the palace. The emperor married his mother's niece, but demoted the empress several years later. In 1661, Shunzhi's favorite concubine Donggo suddenly died as a result of grief over the loss of her infant son. She was not a pure blooded Manchu or Mongol, and was seven years older than the emperor, but because she was his favorite she attracted the jealousy and ill will of the other concubines and the deposed empress. One of them deliberately gave her infant son items from another prince who was infected with small pox, to prevent "tainting of the blood line." A short while after she died, overwhelmed with grief himself, Shunzhi contracted smallpox and soon died. He was only 24. It was also believed by some that the young emperor did not pass away, but left the palace to become a monk. Before he died, Shunzhi appointed four regents govern for his child son, Xuanye - Oboi, Sonin, Suksaha, and Ebilun. It is believed that Kangxi was chosen as his successor partly because he had already survived an attack of smallpox. Shunzhi was interred in the Eastern Qing Tombs (清東陵), 125 kilometers/75 miles east of Beijing, in the Xiaoling (孝陵) mausoleum complex (known in Manchu as the Hiyoošungga Munggan). Shunzhi’s father, Huang Taiji, had changed the name of the dynasty from "Later Jin" to "Qing" in 1636 because of the fraternal struggles and skirmishes between brothers and half-brothers for the throne. According to Daoist philosophy, the name “Jin” has the meanings of metal and fire in its constituents, a circumstance which was thought to ignite the tempers of the brothers of the Manchu Royal household into open conflicts and wars. Huang Taiji therefore adopted the new name of Qing, 清, the Chinese character of which has the water symbol [3 strokes] on its left hand side. It was hoped that the new name, which means clear and transparent, with its water symbol, would put out the feud among the brothers of the Manchu Royal household. Shunzhi ultimately took another step to consolidate the power of the emperor. His grandfather Nurhaci had organized the Manchu forces into Eight Banners, or hereditary military groups, arranged in a hierarchy of importance. Leadership of each of the Eight Banners was passed in succession to the heir of the previous leader, but there was the potential for the leadership of one or more banners to be usurped by a more powerful pretender. To forestall the possibility that an enemy might take charge of one or more Banners this problem, Shunzi ordered the Upper 3 Banners- Plain Yellow, Striped Yellow, and Plain White to be put under the direct control of the emperor. This tradition was maintained until Yongzheng and Qianlong's reign, when they took the step of putting all Eight Banners under the emperor. It is noteworthy that the Shunzhi reign was generally free of corruption, as Shunzi despised corrupt officials. Johann Adam Schall von Bell was a Jesuit missionary and astronomer who arrived in China in 1622. He had been trained in Rome in the astronomical system of Galileo, and the Chinese, impressed with the superiority of Western astronomy and gave him an official assignment translating Western astronomical books and reforming the old Chinese calendar. In 1644, when the Manchu established the Ch'ing dynasty, Schall was appointed head of the Imperial Board of Astronomy. After he cured the Empress Dowager of a strange illness, Schall became the trusted adviser of the young emperor Shun-chih, (Shunzhi) who called Schall "mafa" (“grandfather”). The Emperor permitted Schall to build a church in Peking in 1650 and attended services himself several times. Schall’s intimacy with the emperor made it possible for the Jesuits to conduct their mission work openly, and it is said that 500,000 converts were found during this period. After Shunzhi’s death in 1661, Schall was imprisoned and condemned to death. The sentence was never carried out, but Schall died soon after his release because of the privations he had endured in prison. 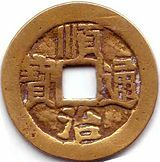 Coin from the reign of the Shunzhi Emperor. Grandmother: Empress Monggu, from the Yehe Nara clan. Concubine from the Tunggiya clan (1640-1663). Her family was of Jurchen origin but lived among Chinese for generations. It had Chinese family name Tong (佟) but switched to the Manchu clan name Tunggiya. She was made the Ci He Imperial Dowager Empress (慈和皇太后) in 1661 when Kangxi became emperor. She is known posthumously as Empress Xiao Kang Zhang (Chinese: 孝康章皇后; Manchu: Hiyoošungga Nesuken Eldembuhe Hūwanghu). Donggo, Concubine from the Donggo clan (d. 1660), the concubine with whom Shunzhi was deeply in love, posthumously raised to Empress Xiao Xian Duan Jing (孝獻端敬皇后). ↑ Chapter IV. The Sovereign-Subject Relationship Between the Qing Dynasty Emperor and the Dalai Lama, China Tibet Information Center. Retrieved August 21, 2007.
d'Orléans, Pierre Joseph, Ferdinand Verbiest, and Thomas Pereira. 1971. History of the two Tartar conquerors of China; including the two journeys into Tartary of Father Ferdinand Verbiest, in the suite of the Emperor Kang-hi, from the French of Père Pierre Joseph d'Orléans, to which is added Father Pereira's journey into Tartary in the suite of the same emperor, from the Dutch of Nicolaas Witsen. New York: B. Franklin. This page was last modified on 15 September 2015, at 17:06.